Thousands of homes may still be without gas supplies at Christmas after an explosion brought down power lines near a sub station in Lancashire. A gas leak was being fixed on Monday morning when a gas main ruptured, setting light to an overhead power cable at Holme Lane in Rawtenstall. 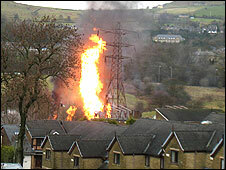 The blast left 18,000 homes without gas and 17,000 without electricity. The National Grid said it may not be able to restore all gas supplies in the area before Christmas Day. It has urged those affected in the Bacup, Waterfoot, Rawtenstall, Newchurch and Crawshawbooth areas to turn off all gas supplies and equipment. A spokeswoman said: "National Grid apologises for any inconvenience and is making every effort to restore gas supplies as soon as possible. "However, we may not be able to restore all supplies before Christmas Day. "The safety of local people is our top priority. We are working with the local authority to identify people who need special help. "We are appealing to people to be good neighbours and check on those they know to be elderly or infirm." 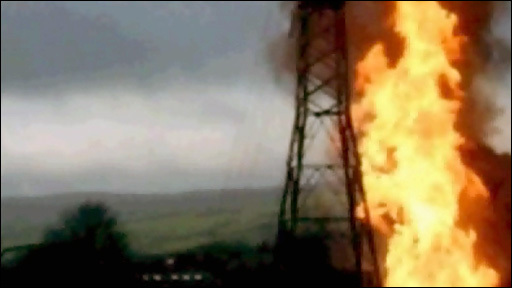 A United Utilities spokesman said about 17,000 homes were without electricity after the blast, but all were expected to be reconnected by 2000 BST. Homes were previously being given power on a two-hour on, two-hour off rota system while the problem was dealt with. The spokesman said: "There was a serious gas escape and fire this morning, on a gas main owned by National Grid. "The fire damaged an electricity line in the vicinity, owned by United Utilities. "At the request of the fire service, United Utilities engineers shut off power to the electricity line at around midday, so that the blaze could be tackled." A police cordon remains in place around the area. Traffic on the nearby A56 Edenfield bypass is affected and neighbouring properties have been evacuated.